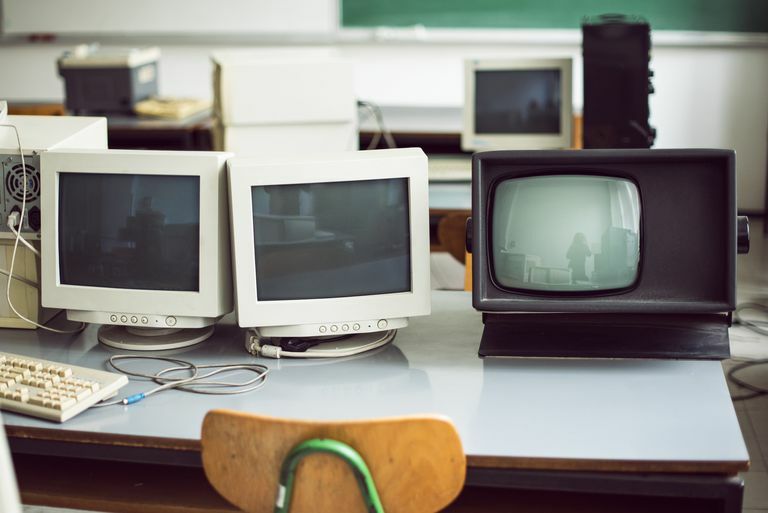 Due to their size and environmental impact, older CRT based displays are no longer produced for general consumer use anymore. If you are looking to get a display for your computer, check out our LCD Monitor Buyer's Guide which refers to the various features and technologies behind modern available computer displays. Cathode Ray Tube or CRT monitors are the oldest forms of display for PC computer systems. Many of the earliest computers had their displays output to a standard composite video signal to be displayed on a regular TV. As time progressed, so did the level of technology used for computer displays. All CRT monitors are sold based on their screen size. This is typically listed based on the diagonal measurement from the lower corner to the opposite side upper corner of the screen in inches. However, the monitor size does not translate into the actual display size. The monitor's tube is generally partially covered by the external casing of the screen. In addition, the tube generally cannot project an image to the edges of the full-size tube. As such, you really want to look at the viewable area measurement given by the manufacturer. Typically the viewable or visible area of the monitor will be approximately .9 to 1.2 inches smaller than the tube diagonal. There are a wide variety of resolutions available in between these standard resolutions that can also be used by the monitor. The average 17" CRT should be able to easily do the SXGA resolution and may even be able to reach the UXGA. Any 21" or larger CRT should be able to do UXGA and higher. The refresh rate refers to the number of times the monitor can pass the beam over the full area of the display. This rate can vary widely depending on the settings the user has on their computer and what the video card that is driving the display is capable of. All refresh ratings by manufacturers tend to list the maximum refresh rate at a given resolution. This number is listed in Hertz (Hz) or cycles per second. For example, a monitor spec sheet may list something like 1280x1024@100Hz. This means that the monitor is capable of scanning the screen 100 times per second at the 1280x1024 resolution. So why does refresh rate matter? Viewing a CRT display over long periods of time can cause eye fatigue. Monitors running at low refresh rates will cause this fatigue in a shorter amount of time. Typically, it is best to try and get a display that will display at 75 Hz or better at the desired resolution. 60 Hz is considered the minimum and is the typical default refresh rate for video drivers and monitors in Windows. Many manufacturers and retailers tend to not list the dot pitch ratings anymore. This rating refers to the size of a given pixel on the screen in millimeters. This tended to be a problem in past years as screens that attempted to do high resolutions with large dot pitch ratings tended to have a fuzzy image because of the color bleeding between pixels on the screen. Lower dot pitch ratings are preferred as it gives the display greater image clarity. Most ratings for this will be between .21 and .28 mm with most screens having an average rating of about .25 mm. One area that most consumers tend to overlook when purchasing a CRT monitor is the size of the cabinet. CRT monitors tend to be very bulky and heavy and if you have a limited amount of desk space, you will likely be limited to the size of monitor that you can fit in the given space. This is particularly important for the depth of the monitor. Many computer workstations and desks tend to have shelves that fit around the monitor that also have a back panel. Large monitors in such an environment can force the monitor extremely close to the user or restrict keyboard usage. CRT displays now have a wide variety of contours to the front of the screen or tube. Original tubes similar to TV sets had a rounded surface to make it easier for the scanning electron beam to provide a clear image. As technology progressed, flat screens arrived which still had the contour on the left and right but a flat surface vertically. Now CRT monitors are available with perfectly flat screens for both horizontal and vertical surfaces. So, what does the contour matter? Rounded screen surfaces tend to reflect more light causing a glare on the screen. Similar to low refresh rates, large amounts of glare on a computer screen increases the amount of eye fatigue.